The Holocaust rightly provokes passionate emotional reactions, which have on occasion prompted strong artistic responses. The old and valid argument states that to reduce the sheer scale of what happened to the level of personal drama inevitably trivialises the appalling nature of what took place. But the counter argument, equally valid, suggests that the only way cinema can effectively convey the horror of such events to an audience is through personal stories, ones we can empathically relate to. Just as we have trouble imagining the concept of a truly infinite universe, when you list the number of dead in millions, it is beyond what most of us can really comprehend. But imagine that included in those millions are your entire immediate family, and think about what that would mean to you. Now imagine that it also includes everyone you ever met, and their families, and their friends and their families. You're starting to get the picture, but you're still not even close. Many a feature film has attempted to communicate the horror of the experience of the Nazi death camps with varying degrees of success. In the end they all fall victim to that same criticism, that they reduce the enormity of the Holocaust to background action against which personal dramas can be played out. But audiences tend to connect with individual experience just as they would with someone they know. The bottom line, however, is that any feature film, and most especially one with a lot of money invested in it, will eventually shy away from the extremes of what really happened. The film-makers want the audience to react emotionally, to engage with the characters, to understand the suffering, but to present them with the full graphical reality of just what took place risks upsetting or offending the very people who will put that movie into profit. Documentaries, for the most part, do not suffer from the same constraints and have always been more successful at communicating the bigger picture, and the Holocaust in particular has been well served by the medium, both in the quantity and quality of the work produced. If Claude Lanzmann's nine-and-a-half hour Shoah (1985) stands as the definitive modern work on the subject, then Alain Resnais' 1955 Night and Fog [Nuit et brouillard] must be regarded as an essential companion piece, a work of equal importance and power, despite its far briefer running time. Where Lanzmann explores the atrocities through the personal recollections of camp survivors, witnesses and ex-Nazis, Resnais' film, while also made from a personal viewpoint, focusses on the bigger picture, a journey that began with anti-semitism and ended in mass extermination. 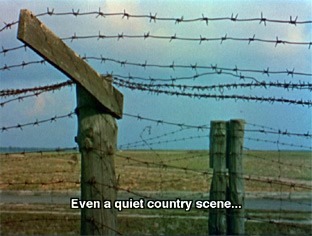 The narration, written by Mauthausen concentration camp survivor Jean Cayrol and delivered by actor Michel Bouquet with a mixture of sober reflection, scepticism and suppressed anger, equates the rounding up of the Jewish population and their transportation to the camps to an industrial process, effectively communicating the cold inhumanity of what took place. Made just ten years after the end of the war, this was for many their first direct exposure to the full horror of the Nazi concentration camps. Opening with newly shot colour footage of the now deserted camps, overrun by greenery and giving little hint of what once took place there, the slow tracking shots of these sequences give way to heroically framed images of Germany's new rulers and their supporters lifted from Leni Riefenstahl's Triumph of the Will, and then to stills and footage shot by the Nazis themselves of the rounding up of the Jewish population and their arrival at the camps. The switches from the colour footage to the archive material are perfectly judged, with footage the trains rolling into the camps at night cutting to a slow drift along similar tracks, now overgrown with weeds, the camera coming to rest on its grim destination like a terrible memory. For a modern audience, one made aware what took place here through education, literature, film and television, even the loading of human cargo into the trains provokes a shudder of realisation. It is, from a modern perspective, an often retold story, but Night and Fog's approach makes it unlike any other film on the holocaust you are likely to have seen. A key aspect of this is its chilling sense of understatement, often achieved through suggestion and a choice use of words. Thus the lengthy tracking shots of the primitive latrines and wooden three-to-a-hole sleeping areas in the abandoned camps are as powerful as the archive photos of prisoners, stripped of all dignity and forced to stand naked on parade for hours at a time. As the camera drifts past the camp hospital, with its false hope of a soft bed and medical treatment, the narration talks of unnecessary operations and amputations, not always carried out by medical personnel, and the colour footage gives way to stark black-and-white stills of the operating tables, one of which has a guillotine attached and a drain for the blood. At times, the narration itself seems to step back in disgust, leaving the details to our imagination: "Useless to try and describe what went on in these cells," we are told of the prison block (an absurd enough notion in what is already the worst kind of prison camp). "In cages designed so that inmates could neither stand nor lie down, men and women were methodically tortured for days on end. The air vents were not soundproof." It is in the film's final stages that Resnais takes a more direct approach and exposes us to the true horror that until then we have been creating largely in our minds. Bodies that are burned, starved, mutilated and decapitated, bones turned into fertiliser, skin used by guards as paper on which to draw pornographic pictures – this is sickening footage that you want to but absolutely should not turn away from. And yet the most disturbing shot of all is a slow pull back to reveal a mountainous pile of women's hair that has been shorn from the heads of arriving inmates, an image that conveys the sheer scale of what happened better than anything I have ever seen. "At 15 pfennigs a kilo," we are informed, "it's used for making cloth." François Truffaut said of Night and Fog that it was "Not a documentary, or an indictment, or a poem, but a meditation on the most important phenomenon of the twentieth century," and novelist Philip Lopate has called it an "antidocumentary," and although I find myself in complete agreement, I would also argue that, especially viewed from a modern perspective, it stands as one of the most extraordinary examples of the documentary film par excellence. It is factual, educational, and yet also personal and political in all the ways that more recent high profile works of the genre have been championed for. 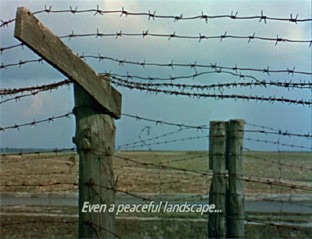 Though it does not provide a detailed history of the process that led to the holocaust, it connects us, the audience, to those who suffered and survived it far more effectively than any of the feature films that have used the concentration camps as a dramatic device, however well intentioned, and at just 31 minutes in length does so with extraordinary economy. Fifty years after its release, Night and Fog remains a disturbing, upsetting, brilliant example of the documentary film at its most powerful and affecting, and a devastating warning from history that seems to have repeatedly gone unheeded. "War nods off to sleep," the film warns us at its conclusion, "but keeps one eye always open." The two DVDs under examination here are the recently released UK disc from Nouveaux Pictures, and the already available US disc from Criterion. Neither of the DVDs are regionally encoded, though the Nouveaux release is PAL and the Criterion NTSC. Both discs claim to be remastered from a restored print, and it seems likely that the same film source was used for both transfers. That the archive footage suffers from occasionally severe scratches, dust spots and damage is neither surprising nor an issue, given that we are used to seeing wartime news footage in such a condition. The damage is on the original material and would thus also have appeared on the cinema print when Night and Fog was first screened. One short sequence of a train departing suffers from severe frame jitter, usually a projection fault caused by a too-small loop above or below the lens or sprocket damage. Again this may have been on the original film, as it occurs only on one piece of footage and is intercut with another, perfectly stable shot and appears on both DVDs. The transfer on both discs is very good, given the age and source material, with contrast solid when the material allows it to be (the contrast on some of the photographs is inevitably harsh, while on others a little grayed out). The definition is fine on the newer footage on both prints, though the edge would probably have to go to the Criterion disc, which displays a slightly higher level of fine detail. The colour, however, is richer on the Nouveaux disc, having something of a faded look on the Criterion disc when played on a computer monitor, but looking more naturalistic than that on the Nouveaux disc on a TV screen. It should be noted that though only a 31 minute film, the Criterion disc includes 6 chapter stops, while the Nouveaux disc has none. Both discs come with optional subtitles, but there are nonetheless some key differences between them. The first issue is most noticeable on the Criterion disc, which for reasons known only to the company are all italicised (admittedly, this is common for narrated segments of a film in order to differentiate it from dialogue, but all of the words delivered here are in voice-over), and are a light grey rather than the expected white. While this presents no legibility problems on the colour segments, on some of the visually busier or lower contrast black-and-white footage they can prove quite hard to read. The subtitles on the Nouveaux disc, however, are in a regular font, white, outlined in black and clearly legible throughout the film. Score one for Nouveaux. But there's more to it than that. Nouveaux prove that their disc is no straight port of the Criterion one by virtue of the translation, which though largely similar to that on the Criterion disc, differs quite a bit in the choice of words, sometimes enough to alter the feel of a sequence. Compare the screen grab above from the Criterion disc with the one from the Nouveaux disc at the top of the page and the difference in clarity and phraseology of the subtitles is evident (as is the colour saturation of the picture). As someone who has been involved in producing French subtitles for a short film with the help of three translators, I am well aware of the difficulty of creating an exact translation, especially when suggestion and metaphor are employed. But consider the sequence regarding the torture in the prison block, where the subtitles on the Criterion disc tell us "The air vents were not soundproof," a line loaded with suggestion that allows us to imagine what this must mean. On the Nouveaux disc, however, the line is translated as, "The air vents did not muffle the cries," which is more specific and somehow less horrific. Other instances are more obvious, with "a perturbing nurse" on the Nouveaux disc becoming "a terrifying nurse" on the Criterion one. Not being a fluent French speaker I cannot vouch for which one is more accurate and, indeed, which of the two more appropriately capture the tone of the original French, but I have to admit I preferred the Criterion translation here. Both serve the film well, but the Criterion subs are more suggestive, more poetically structured. Both discs contain the original mono soundtrack, though the Nouveaux disc is Dolby 2.0, spreading the sound across the front speakers, while the Criterion disc uses the centre speaker only. There is inevitably a narrowness of dynamic range, but given this restriction both the music and narration are clearly reproduced. Playing the discs side-by-side makes the 1 frame PAL speed-up very evident, of course. One of the extra features on the Criterion disc is an isolated music track, allowing you to hear Hanns Eisler's powerful, emotive score without the accompanying narration. If the discs have been scoring points of each other evenly up to this point, then here is where Criterion proves an easy winner. Though the special features are minimal, they are still ahead of the Nouveaux disc, which has none at all, having only "Play" to select on the main menu. The key extra on the Criterion disc has to be the Resnais Interview (5:20), an extract from a 1994 radio interview with the director from the programme Les Étoiles du cinéma in which he talks briefly about the commissioning of the film and the censorship problems it ran into, not because of what was shown in the camps, but because a French policeman could be seen in one shot (Resnais himself hadn't even noticed him) and the censorship board would not sanction even the suggestion of collaboration on this matter, even though it clearly took place. The interview is conducted in French with English subtitles. Crew Profiles provides concise biographies of nine of the film's key personnel, including Resnais, Cayrol and a young assistant director named Chris Marker. Also included is the Isolated Score mentioned above. 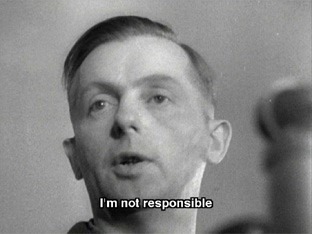 Night and Fog remains one of the most crucial films about the Holocaust and one of the most important documentaries of the twentieth century. The film ends on a warning that has proved all too prophetic: "We pretend it happened only once, and in a given time and place. We turn a blind eye to what surrounds us and a deaf ear to humanity's never-ending cry." As the term 'genocide' has been replaced by the even more insidious 'ethnic cleansing', there is a sense that those in power will never learn from history, but while there are films like Night and Fog then the majority of ordinary people, save for those nasty morons who still claim the holocaust never actually happened, have no excuse. As for which disc to go for, it's actually a tricky choice – the Criterion has more effective translation, slightly sharper picture and a couple of extras, but the Nouveaux DVD has much clearer subtitles, and the extra features it is missing are hardly extensive. If it's down to cost then the Criterion disc can be picked up for about half the price of the Nouveaux one, at least for now. My personal preference is for the Criterion disc, for the translation and hearing the soundtrack at its correct speed, but I have to admit that if a student asks to see the film, then for the clarity of the subtitles alone, it's the Nouveaux disc that gets popped in the player.